Travelodge Stephens Green Distance to the centre of town 1.2 km price per day from €65 In a quiet position just off Grafton Street and St Stephen's Green, this small 3-star hotel can offer a peaceful night’s sleep close to Dublin’s vibrant city centre as well as free Wi-Fi in public areas. 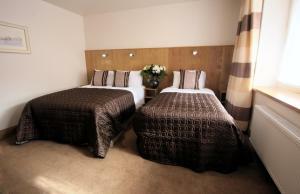 The city’s main attractions are within easy walking distance of the Travelodge Stephens Green. Stroll back to the comfortable hotel after shopping on Grafton Street; sampling local cuisine and entertainment on Temple Bar; or exploring the Guinness Brewery. Baggot Court Townhouse Distance to the centre of town 1.8 km price per day from €60 Located in Dublin city centre and a short stroll from St. Stephen's Green and Trinity College, this Georgian town house offers free Wi-Fi and free guest car parking. Major attractions including Temple Bar and the Grafton Street shopping area are easy to reach. The Baggot Court Townhouse was home to the Lord Mayor of Dublin in 1844, and a relaxed and friendly atmosphere runs throughout. All rooms have a flat-screen TV, quality beds and free tea and coffee. The Lansdowne Hotel Distance to the centre of town 2.3 km price per day from €70 The Lansdowne Hotel is a 10-minute walk from Dublin’s Aviva Stadium and the RDS. This boutique hotel offers spacious rooms, home-cooked food, and free limited parking. Rooms are decorated in warm colours and feature a satellite TV, work desk and an armchair. They also include telephones, tea/coffee-making facilities and private bathrooms with showers and hairdryers. Serving Irish breakfast each morning and traditional Irish cuisine in the evening, Druids Restaurant has mood lighting and Celtic artwork and tapestries from the Book of Kells decorating the walls. Hotel St George Distance to the centre of town 0.5 km price per day from €71 Located at the top of O’Connell Street, The Hotel St. With private parking and WiFi, bedrooms have private bathrooms. Individually furnished, all rooms share the original Georgian character of the building. The Hotel St George bar serves a wide variety of beers, wines and spirits. George is within easy walking distance of Trinity College, Temple Bar and Abbey and Gate Theatres. There is a bus stop outside the hotel and Dublin Airport is just 5 miles away. Dublin Citi Hotel of Temple Bar Distance to the centre of town 0.6 km price per day from €59 This hotel is located in a 19th-century building in Dublin’s Temple Bar district. Guests can explore Dublin Castle and Trinity College, both are just a 5-minute walk away. Rooms at The Dublin Citi Hotel of Temple Bar have a warm or fresh décor. They feature a TV, ironing equipment and tea/coffee-making facilities. Dublin Citi Hotel has a partnership with Crunch Fitness in Temple Bar, which allows guests to enjoy complimentary access to the premises during their stay. Fitzsimons Hotel Temple Bar Distance to the centre of town 0.6 km price per day from €59 In Temple Bar, the boutique Fitzsimons Hotel overlooks the River Liffey. With a 24-hour reception the hotel has llate night bars with live music, a nightclub and a rooftop terrace. The Fitzsimons Hotel has rooms with en-suite bathrooms and a flat-screen TV. Most rooms have city views and some have private balconies. 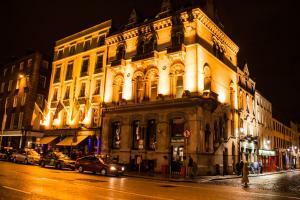 The hotel is surrounded by Temple Bar’s most famous late bars, nightclubs and restaurants. Blooms Hotel Distance to the centre of town 0.6 km price per day from €53 Blooms Hotel is located in Dublin’s Temple Bar district, 150 metres from Trinity College and Dublin Castle. It has a traditional Irish pub, a nightclub and rooms with flat-screen TVs. The VAT House Bar is a traditional Irish pub and gets its name from the vat house in the Guinness Brewery. Club M is the hotel's popular nightclub, where guests receive free entry. Grafton and Henry Street, Dublin’s premier shopping areas, are both within a 10-minute walk from the hotel. The Townhouse Dublin Distance to the centre of town 0.4 km price per day from €42 Set in Dublin’s historic centre, this refurbished Georgian townhouse is less than 15 minutes’ walk from Trinity College. Some rooms feature views of the Japanese garden from private balconies, or city views from Georgian sash windows. Croke Park is less than 20 minutes away on foot, and the Guinness Storehouse is easily accessible by tram or bus. A specially designed free Wi-Fi area is available for guests to use. Annandale House Bed & Breakfast Distance to the centre of town 3.1 km price per day from €68 Located in Dublin's residential area of Drumcondra, the Annandale House Bed & Breakfast is just 10 minutes' bus ride from the city centre's O'Connell Street. Dublin Airport and the M50 motorway are just a 10-minute drive away. Situated 5 kilometres from Dublin city centre and from the famous Temple Bar district, Annandale House offers rooms with free parking and free Wi-Fi. Each room at the family-run Annandale House Bed & Breakfast features an en suite bathroom with free toiletries, tea/coffee making facilities, a TV, ironing facilities, and garden views.